Thanks for reminding me about cooking chicken this way. Back in the States, that sort of sandwich was very popular when I was growing up in the Stone Age. 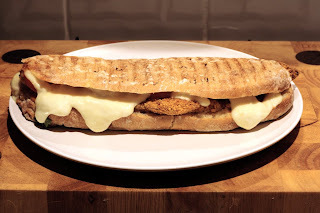 It was often served on a large Italian roll and called a chicken parmegiana 'hoagie.' Those are also called subs and other variations depending on location. I'm going to try this again! These sandwiches are quite common in sandwich shops here in the UK too. I've had versions where they haven't been heated and you eat it cold too. Glad to know I've inspired you to re-create something you used to eat!